When you move to a rural property you often have a lot of questions. Can I pump water from the river? Who can tell me why my cattle are doing poorly? What’s that weed in my paddock? Do I need to control it? What is the Native Vegetation Act? Why has the Livestock Health and Pest Authority sent me a rates notice? Brunswick Valley Landcare has collated a great list of places to go to find out about all sorts of topics including attracting wildlife to your property and weeds. 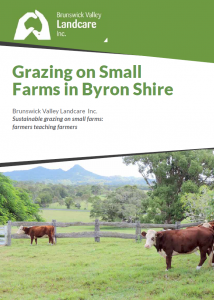 As part of BVL’s Sustainable Agriculture grant and Byron Shire Council’s Rural Land Use Strategy two fact sheets were developed to help landholders develop a plan for their properties and understand some of the legislation that may effect them. Sustainable grazing on small farms: famers teaching farmers. Brunswick Valley Landcare’s booklet is available in hard copy from the Byron Shire Council Building and the Rural Co-op in Mullumbimby, or contact the Landcare Support Officer. 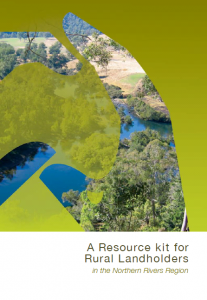 Want to better manage your stock and waterways for productivity and environmental benefits?The Australian River Restoration Centre, WaterNSW and Rivers of Carbon have put together an updated (2019) practical guide to help New South Wales farmers. Need to fence in a floodplain or along your creek? Rapidly flowing flood waters can destroy houses, bridges, roads … and fences! So is it possible to design a fence that will withstand flood waters? The answer is no – but it is possible to design one that will suffer minimal damage and that will be easy to repair once the flood waters recede. This brochure presents design options for low-maintenance, flood damage resistant fencing.